Traverse City is a town of about 15,000 on the Northwestern coast of Michigan, where the local news often has to do with roaming livestock in need of reclamation. During the summer, the town's population swells with people in from Detroit or Chicago escaping to vacation homes and enjoying the town's local festivals. In the course of one week every July, half a million people attend the annual Cherry Festival. 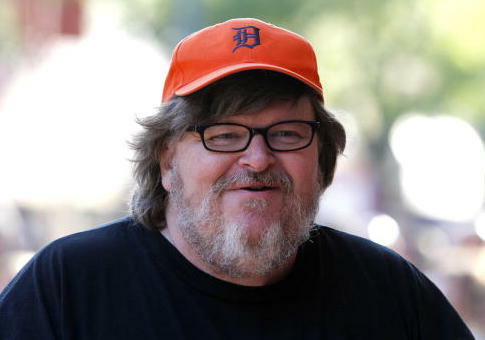 Michael Moore's Traverse City Film Festival began in 2005, and this year runs from July 31 to Aug. 5. The award Moore is presenting to Fonda that has only been given out once before, in 2015, to Geraldine Chaplin. Fonda's selection is overtly political; Moore called her "one of (his) personal heroes" in a letter announcing the selection. "There are few other artists who have had the courage to stand up for basic human values—peace, women's rights, etc.—more than Jane Fonda. What an honor for us to welcome and be inspired by the work of this American treasure. Her voice is needed now more than ever," Moore wrote. A number of locals voiced their concerns with the decision. Nicole Bellanger told the Free Beacon that she is "disappointed in our town for embracing (Moore) the way they have. It's great for bringing money in but I wish it were someone else that was doing it. Someone with integrity or actually supports our military/country." She said the festival has gotten worse over the years as Moore has felt more comfortable highlighting his agenda. "It's become a place for him to push politics," she said. "This year especially." When she found out Fonda would be receiving a Lifetime Achievement Award, Bellanger's emotions were raw. She said she was "upset. Disgusted. Confused. Sad for all the vets. My husband was in the Marines, his dad was in the Army. It's part of their family. And it's a slap in the face to anyone who has ever served this country. They joined the military and were proud, and what she did to their image and made their families feel is sickening." Traverse City native Daniel Rozanski told the Free Beacon that he thought Fonda being honored "was a joke" when he first heard. "My grandfather saw friends die at his side in Vietnam. There is no forgive and forget for that." For Shane Crampton, whose father died during the Fall of Saigon when Crampton was only four years old, "what she did should never be forgotten." While several Vietnam veterans told the Free Beacon they were offended Fonda would be in town at all, let alone to receive an award, they did not want to give Moore the attention they felt he was seeking by complaining too vociferously. "I see it as another attention-getting ploy by Michael Moore," veteran Duane Lindstrom said. "He's a known social agitator, perhaps he feels that he is picking up the ball that she was carrying. He probably admires her more for her political stances than for her screen credits." Lindstrom also suggested the avowed socialist may have other reasons for honoring Fonda: "Sooner or later, it comes down to money." With Moore and Traverse City, money has always been an issue. After refurbishing local movie house the State Theatre and opening it for business—showing classic movie matinees for 25 cents, hosting sing-alongs, inviting a local corgi to greet guests as they came to watch the latest royal wedding—he utilized volunteers to keep it, and his festival, afloat rather than paying the state's minimum wage. A local business owner who worked with Moore in the early days of the film festival and asked not to be quoted because she fears reprisals from the documentarian said that she was happy to volunteer because "I love film and I love my community." However, "I got upset when I realized how much money they were spending to fly everyone else in" from Hollywood and other locations when counted against the value of her donated time. Neither the Traverse City Film Festival nor the State Theatre returned a request for comment. This entry was posted in Culture and tagged Jane Fonda, Michael Moore, Michigan. Bookmark the permalink.